Exactly who did the massacring here is still a matter of some debate. The only thing that everyone seems to agree on is the death toll: four ATF agents and 80 followers of Vernon Howell, a.k.a. 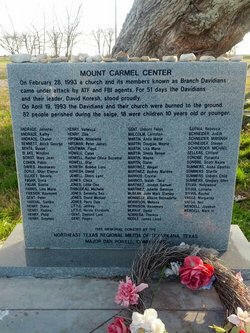 David Koresh, and his splinter group of Branch Davidian Seventh Day Adventists. It happened in early 1993 when the ATF raided, then besieged, then attacked the fortified compound that the Koreshians called Mount Carmel. All that was left was a smoking ruin. There are no signs of the compound any more; the only remnant is a hole, formerly a swimming pool that was used as a bunker during the siege. A little chapel has been built out by the road by the Koreshians and their supporters, incorporating an infrequently-open museum of Davidian history that censures everyone for the bloodshed. Up a dirt road is a grove of young trees planted in rows, one for each Branch Davidian killed. For several years each had a little granite marker at its base with a victim's name and age and the same date of death: April 20, 1993 (The stones were later mortared into a single memorial). 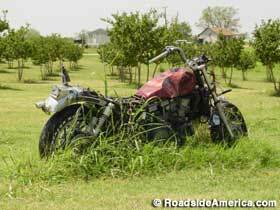 When we visited, a rusting motorcycle stood off to one side, choked with weeds -- David Koresh's? We couldn't say, because our only company was a friendly dog and a lot of grasshoppers. The surviving Koreshians have erected monuments to everyone who died, to eliminate any lingering animosity. Across the dirt road from the trees is a memorial to the ATF officers who were killed in the February 28, 1993 raid, which kicked off the 51 day siege and the eventual storming of the compound. And there's another monument to the people who died in the Oklahoma City bombing, two years to the day after the massacre at Mount Carmel. According to John Anderson, who we encountered at his House Of Horrors attraction north of town, "Some folks believe Oklahoma City happened because of Waco." He also told us that the current Branch Davidian leader, Charles Pace, runs the local health food store, and that the Branch Davidians are "very peaceful people." This may be true, but we were getting this information from a guy who runs an attraction with a giant, laughing skull on the side of its building. Pace has organized about a dozen surviving Davidians into a new church: The Branch, The Lord Our Righteousness. For years he has been trying -- thus far without success -- to turn the massacre site into a visitor destination, with an amphitheater, a biblical petting zoo, a museum and gift shop, a wellness center, a deli, an organic farm, and a model of the tabernacle that housed the Ten Commandments. The intent has always been to de-emphasize the massacre. All parties seem to want very hard to forget about the whole thing. Mount Carmel Massacre Site. Northeast of the city. 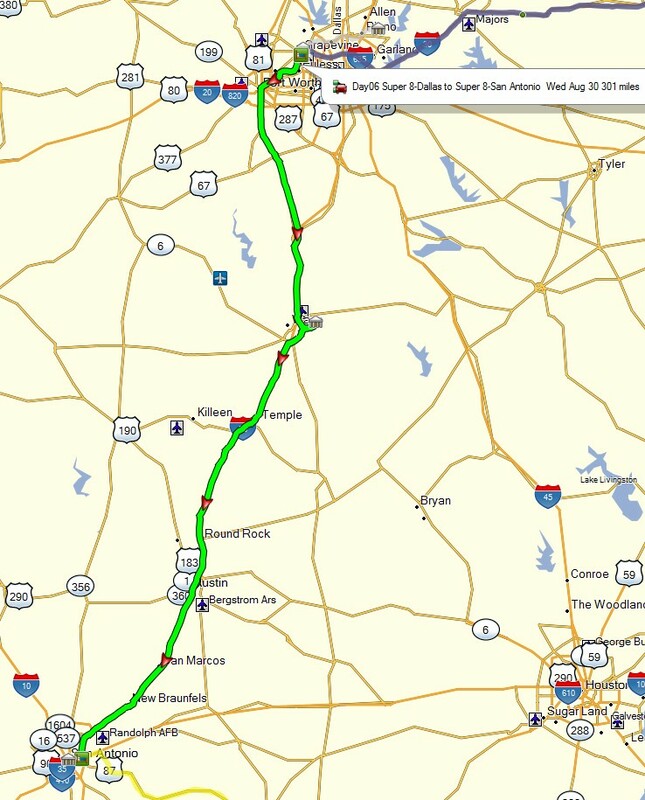 Hwy 2491 (Elk Rd) about five miles east of Loop 340. You'll come to a split in the road, but stay on 2491 which bears to the left. Not far from the split you'll see large, wavy metal gates on the left (Double E Ranch Rd). Just beyond that property is a gravel road on the left (Double EE Ranch Rd). Turn down that gravel road. The Mount Carmel property is a short distance on the right. Dr Pepper was first called "Waco" because it could not be found outside of that city's limits. Waco is now the home of the Dr Pepper Museum, housed Dr Pepper's first bottling plant. It includes the original drug store where Dr Pepper was first served as a brain tonic, and opened as a museum in May 1991. 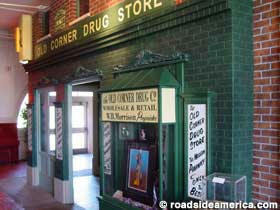 The museum starts with facade of an early 20th century "corner drug store," an important fixture in any romp through soft drink history. There's also a vintage soda fountain and replica bottling assembly line. We hurry along to the good stuff. Dr Pepper memorabilia is everywhere -- a virtual graveyard of retired vending machines, bottle designs, packaging, and advertising. Visitors learn that the copywriter who came up with the slogan "Drink a bite to eat at 1024" -- which propelled Dr Pepper to big sales in the 1920s -- was given a bonus of $25. And Dr Pepper is officially trademarked and labeled without the "Dr." period because the typeface on its bottles made it look funny. Perhaps the most popular exhibit in the museum is a continuous loop of old Dr Pepper commercials running on a TV monitor, interspersed with one touting the soft drink industry as an example of the free enterprise system and of social betterment. "Because the industry has grown and developed with America," says a voice, supposedly of the same guy who narrates all of the Dairy Queen commercials in Texas, "it will continue to reflect and support forward thrusts of national progress." The theme of soda as the lubricant of capitalism is continued on the third floor in the "Foots" Clements Free Enterprise Institute and The Beverage World Soft Drink Hall of Fame. Woodrow "Foots" Wilson was CEO of Dr Pepper during the 1970s -- its golden "Be A Pepper" decade -- and was honored with his own "Foots" brand soda. The Beverage World Soft Drink Hall of Fame has many enshrined members, but all of them are executives, none are women, and only two are from small brands -- one from Crush, the other from Squirt. Nearly lost among all of the gray plaques is the "Not Worth Two Cents" exhibit, which illuminates various aspects of free enterprise. Bottles of special "Vice President of the United States" soda were made, to be presented to home-state favorite Lyndon Johnson when he gave a speech before the American Bottlers of Carbonated Beverages in December, 1963. But by the time that the meeting came around, JFK had been assassinated, Johnson was president, and he was too busy to give speeches to bottlers of carbonated beverages. The ABCB dumped the soda and tried to return the bottles for their two cent deposit, but they were told that the bottles were "not worth two cents." 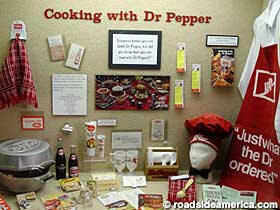 After ingesting all of this information, you might understandably be in the mood for a refreshing Dr Pepper. Unfortunately there are no free samples available at the museum, but the old timey soda fountain will satisfy if it's not closed. You can buy old-fashioned six-packs of bottled Dublin Dr Pepper in the gift shop, but they don't sell any hand-held pry-off bottle openers to get into them. Roadside Presidents Roadside Presidents App for iPhone. Find this attraction and more: museums, birthplaces, graves of the Chief Execs, first ladies, pets, assassins and wannabes. Prez bios and oddball trivia. Available on the App Store.